It looks easy and turns out beautiful in the tutorial by the expert, but what is it like to actually do this method when you’re still learning? 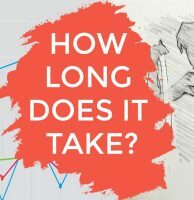 We asked subscribers to our newsletter to volunteer and test the method out, and the results were varied and fascinating. 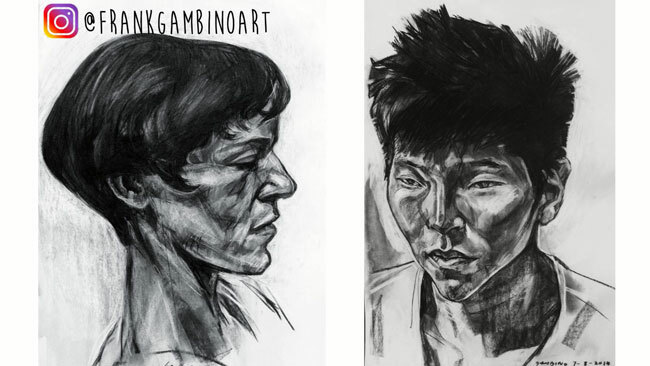 (You can watch the video or read the article below – the content is mostly the same, but you can see more of the drawing process in the video). 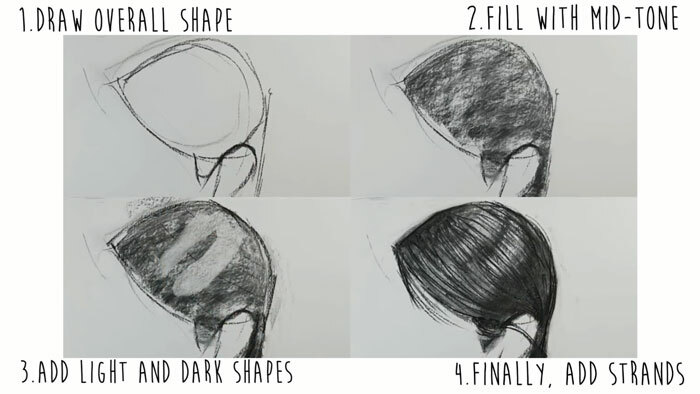 Frank’s method for drawing hair is straightforward – 4 easy steps. But we all know that things that look simple in tutorials aren’t so simple in real life. The expert doesn’t just know the technique, but also has all that muscle memory in their arm and experience in their eyes. So after the tutorial, it all seems to make sense and then you put pencil to paper, and things can go pear shaped quickly. This is the first time we asked viewers of this channel to test out one of our tutorials and we learned so much from it. This is the reality behind the tutorial – what it’s really like to apply these 4 steps. Before we get into it, I just wanted to say how important learning to draw hair is. Hair is overlooked, with artists usually focusing on facial features and things like that. But hair can absolutely make or break a drawing. Also, this method teaches you about bigger principles. One is to put down the big simple shapes of light and dark before going to detail. Another is that it’s easier to start with mid-tone and move towards light and dark rather than going to very dark or light too quickly. 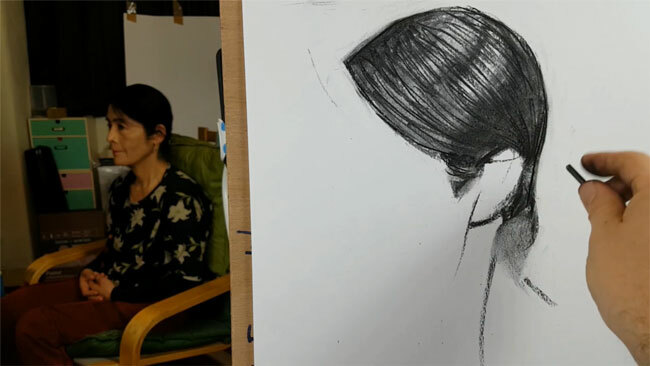 Brenda is experienced with watercolour landscapes but fairly new to figure drawing. She hadn’t seen the hair tutorial so she was able to do a before and after. 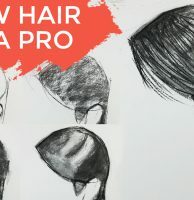 Her before drawing is similar to how many people approach hair – putting down a lot of strands. She does try to show the light reflecting off the hair with these areas left white. It’s a good effort, but it doesn’t have as much volume as it could. Then she watched the tutorial and tried the steps. She did a great job – she put down the overall shape, filled it with a mid-tone, removed some for the light areas, added some for the darkest areas and then finished with a layer of strands. The results feels like a shiny head of hair with real volume. It’s amazing how much she was able to improve on her first try. She said she had tried the method at a class and even received compliments from other artists on it. A few areas for improvement were that she had tried to put down the whole big complex shape of the hair, rather than break it down into big but very simple shapes. She was also a little heavy handed with these stray strands away from the main mass of the hair. These areas are very light and wispy. Our general principle is about the shape first and then hinting at the strands, so that could have worked well. 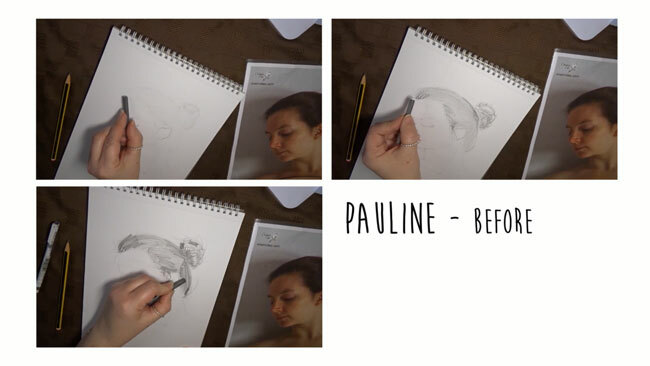 Pauline also was able to do a before and after drawing. Her initial drawing looked like this – a good effort showing light and dark, but she goes to details a little early. She did Frank’s method and did a good job following the steps. She did break down the big shape, but this shape at the back of the hair has come forward to line up with this line, not giving space for her ear to be. I think it wasn’t enough for us to just say ‘instead of one big shape, simplify into a few shapes’. We should have emphasised that the relationship between the shapes is also essential. Where do the edges align with the other shapes? Which lines flow into each other for these simplified shapes? The other thing that happened for a few people was that Pauline added lights and darks to most of the shape, not leaving much of that mid-tone anywhere. So everywhere became either very dark or light, with a lot of contrast and harsh edges. The tones in the model’s hair are subtler than that. She did a great job overall and has shown a great learning spirit by continuing with further iterations of the exercise. 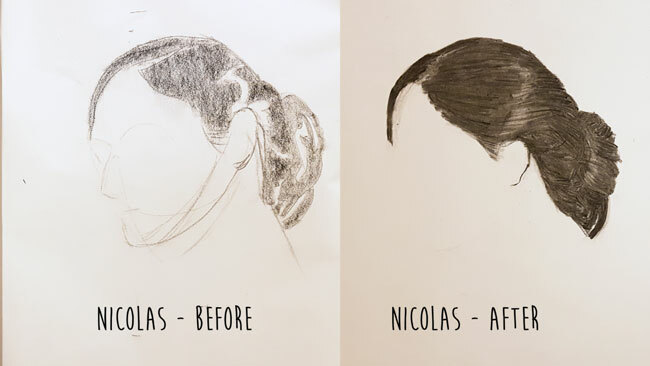 Nicolas was able to do a before and after. The reference photo I sent him had a slightly more complex hairdo, so I was interested to see how it would go. Before viewing the tutorial, he already had the idea of looking for the light and dark shapes instead of seeing strands only, and in his before drawing he got that far. 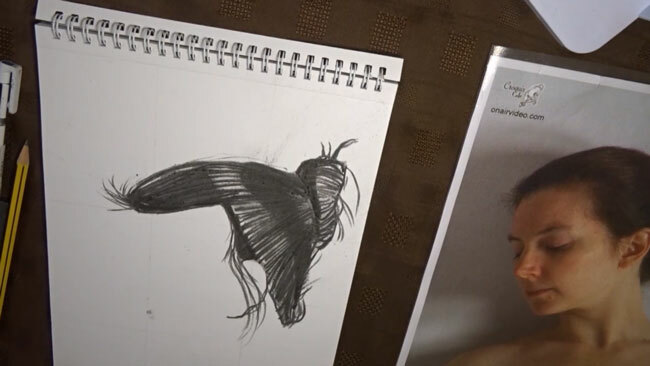 He was using conte pierre noire and did 2 drawings. 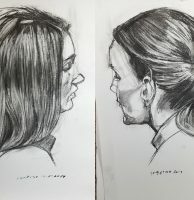 He did a great job with Frank’s method, now using vine charcoal, and produced a lovely drawing despite the complexity of the hair. Some of the light areas got quite strong edges where maybe a softer contrast could have worked. But the light areas were well chosen and the strands, which were going in a lot of directions, were done really well. What a transformation! Danny is a veteran and now works in a technical job, but he is also full of creativity. He has not been drawing long, but recently has felt a boost of confidence – he was even able to take part in the recent Pages of the Sea event and drew a portrait of his friend in the sand to be washed away by the sea. 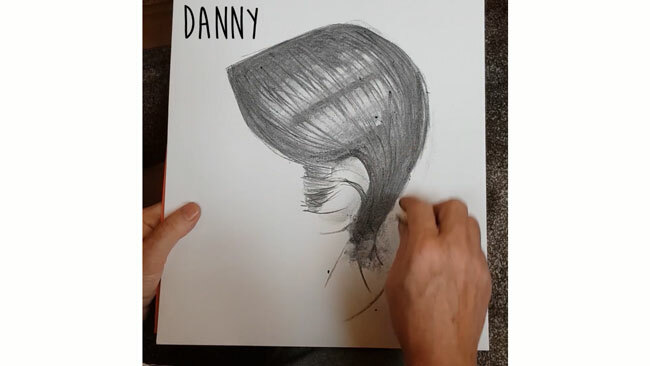 Danny had seen the hair video already, so he didn’t do a ‘before’ drawing. This was his first go doing the technique, and he drew the photo of Mayko in the tutorial. 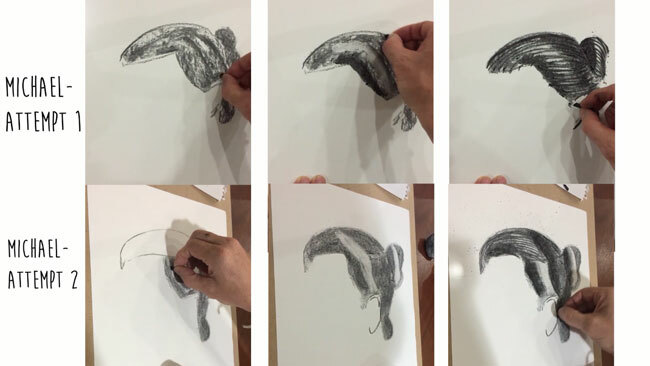 He followed the steps in the tutorial really well – first drawing the shape using some big simple shapes rather than trying to do the whole complex outline in one go. Then he filled with a good flat mid-tone. He removed some charcoal for the light areas and added the darks and then the strands. The result looks really good. One bit of feedback was for this sideburn. It’s got quite a lot of detail and contrast, but the sideburn is quite a light, wispy thing. 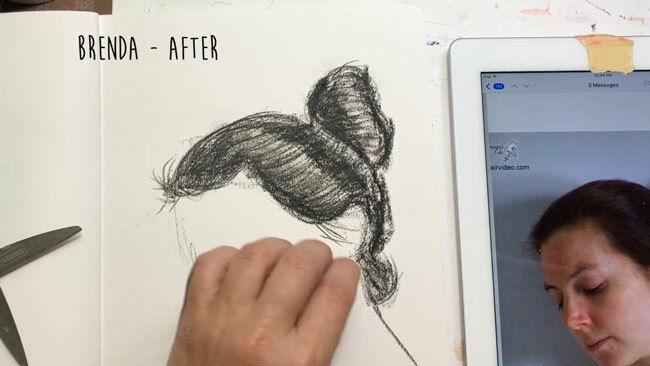 So instead it may have worked better to just put down the shape of it, smudge it a little to give that light feel, remove some of the shape to show that the hair is thinner here – this is what Frank did in his demo. Michael started figure drawing a few months ago. He has really gotten into it, which is brilliant to see, and he’s made a lot of progress already. He had seen the video already, so went straight into trying to apply Frank’s method. His first attempt went really well. It has volume and it is boldly done. I gave him some feedback, and interestingly, it made things worse! I said he ought to break the shape up into simpler shapes, rather than trying to draw the big complex shape off the bat. But I didn’t emphasise the importance of the relationships between these shapes. I talked about thinner lines for the strands and also for softer shapes for the wispy bits, rather than thick lines. The main problem was that I didn’t emphasise that most of the drawing was successful, and the things that were already working were more important than the smaller improvements I was talking about. So I think Michael focused on those things I said, distracting him from the things that were already working, which were more important. I think that is a good lesson generally – whether it’s students trying to figure things out and teachers trying to give good feedback – you’ve got to recognise what is working, not just focus on the things that need more work. Fortunately, Michael is dedicated and he had another go, and tried it digitally, and then had a go with a live model with more complicated hair and lighting. That kind of experimentation and taking the failures as learning experiences is just the right attitude for learning to draw. And last but not least, my wife Lucy tried the method out too. 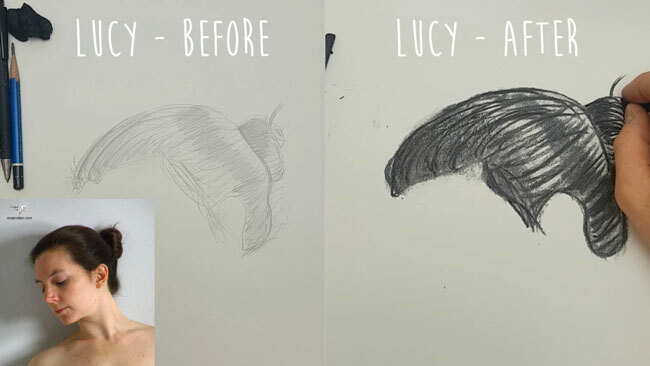 She saw a massive improvement as well!